Find Us - We'll Feed You! Located on Kauai’s legendary North Shore, AMA Restaurant invites you to experience our delectable, Asian-inspired cuisine in the heart of Hanalei. 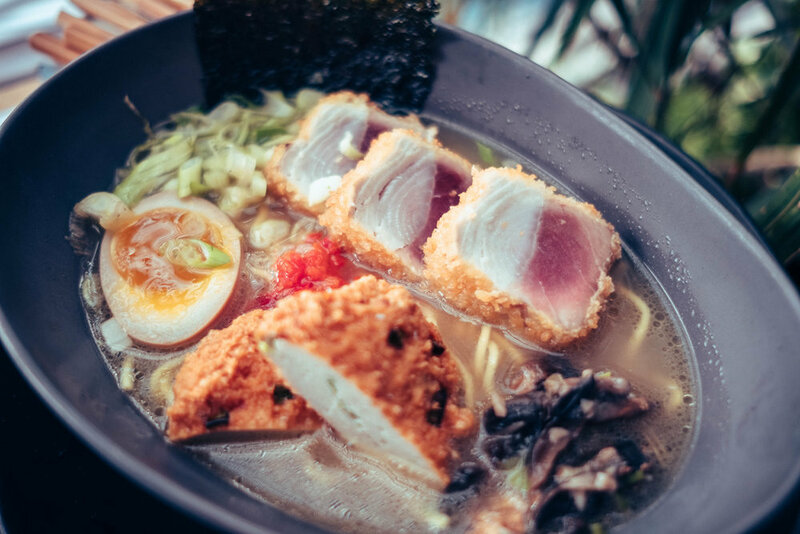 Enjoy freshly prepared noodle, ramen and mazemen dishes paired with Hanalei’s best selection of fine wines and bespoke beverages. Check out AMA’s specialty cocktails. *Consuming raw or uncooked meat, seafood, or eggs, may increase your risk for foodborne illness. Please inform your server of any allergies prior to ordering. Mahalo. Corkage fee - $25 per bottle. 4% surcharge is added to all food and beverage sales for state mandated employee health benefits. *Wineries practicing organic and/or biodynamic farming. AMA Restaurant is certifiably social. Stop by and say Aloha! Copyright 2019 AMA Restaurant, all rights reserved.